“There was more than a bit of a Willy Wonka and the Chocolate Factory vibe,” Risa Nye wrote in her first piece about the Winter Fancy Food Show for EatDrinkFilms, noting the “brightly-hued candy” and desserts that dominated the displays. This week we gather sweet recipes from three of the businesses that Risa spotlights in the conclusion of her survey of the event. Preheat oven to 350 degrees. Butter a 9 inch square baking pan or line your pan with aluminum foil with the shiny side up and edges hanging over for easy removal from pan. Melt butter and chocolates over simmering water on stove or in microwave until smooth. Cool mixture slightly (5 min.). With electric mixer beat eggs, sugar and vanilla in bowl until slightly thickened. Beat in chocolate mixture and blend. Add flour, baking powder and salt and blend. Stir in 4 cookies crumbled into medium size pieces. Pour mixture into prepared pan. Sprinkle with 1 crumbled cookie. Bake 27 minutes for fudge-y consistency until top cracks and sides move away from pan. Bake 8 to 10 minutes longer for cake-like texture. Cool and refrigerate for several hours or overnight. Serve with vanilla ice cream. 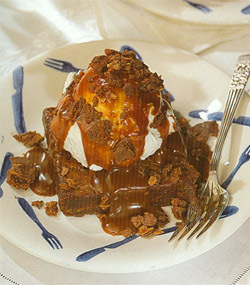 Pour hot caramel sauce over ice cream and sprinkle 3 remaining crumbled cookies over the top of sundaes. Melt butter in heavy medium size saucepan over medium heat. Stir in sugar. 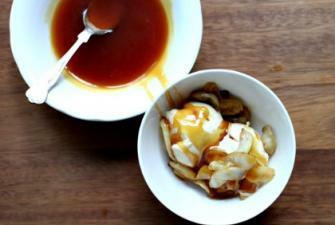 Cook mixture until it turns a rich caramel color, approximately 15-18 minutes (5-8 minutes longer on an electric stove). Swirl mixture occasionally with wire whisk while cooking. Bring cream to simmer in heavy small sauce pan. Quickly remove bubbling sauce from heat when ready; gradually add cream while stirring with whisk. Mixture will bubble vigorously. Return to heat and bring to boil whisking constantly for another 30 seconds. Will keep in refrigerator for months. Microwave before serving. Cooking time: 15 minutes. Prep time: 5 minutes. Melt the butter in a small skillet over low-medium heat. Add brown sugar to pan and stir until well incorporated. Add apples to pan and stir until coated in sugar-butter mixture. Allow apples to cook and sugar-butter mixture to reduce (about 10-15 minutes), stirring frequently, until apples are tender and mixture has become a sticky caramel sauce. Transfer to small bowls, sprinkle with sea salt, and serve with ice cream. Bake your cookies in advance and cool them in the refrigerator. Meanwhile, let your ice cream soften a little. When the cookies are completely cool, spread your ice cream generously between two. (If there’s any heat left in the cookies, the ice cream will melt and slide right off.) Once the sandwich is assembled, refreeze it until serving—and enjoy! 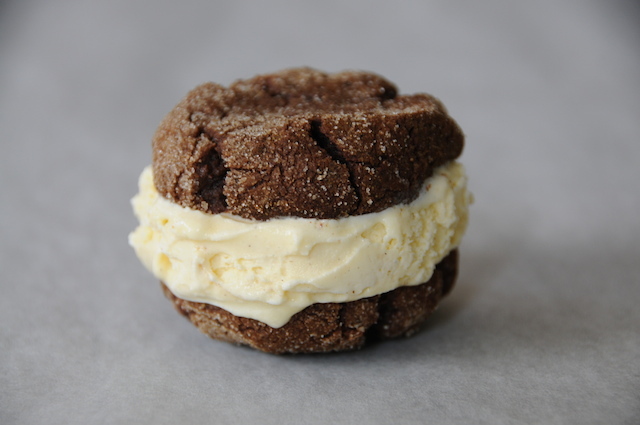 We made this one with Chocolate Spice cookies and vanilla bean ice cream. This entry was posted in Eat and tagged Fancy Foods Show, ice cream, ice cream sandwiches, Risa Nye. Bookmark the permalink.